A stylish, action film directed by Sanjay Gadhvi. I played Kabir, leader of a gang of bike-riding thieves. In the city of Mumbai a motorcycle gang is raiding banks then vanishing on the Western Express Highway. ACP Jai Dixit, a no-nonsense cop, is put on the case. With the help of a thief named Ali he devises a trap to catch the gang but it fails badly. Fuelled by success, Kabir and his gang escape to Goa to perform one last heist � on the biggest casino in all of India. 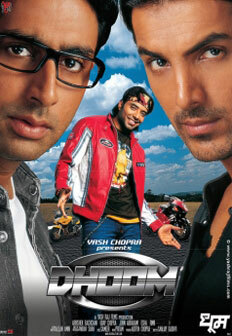 "I will always thank Aditya Chopra for casting me in 'Dhoom' and giving a boost to my career. With 'Jism', 'Paap' and 'Aetbaar' I didn't have a children's audience. With 'Dhoom', kids started liking me. It was a very different role. I came into the narration after 40 minutes. I had no songs, no leading lady, but it didn't matter. The important thing is how honestly you deliver within the space given."